A warm welcome to our fully licensed luxury well equipped 2 bedroomed rental apartment at El Rincon, Alameda del Mar on the Costa Blanca. El Rincon rental has proved very popular. 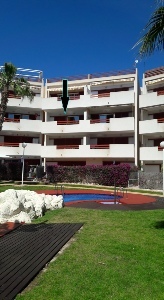 Our apartment is situated on the second floor overlooking the pool. The 2 bedroom apartment has adjoining ensuite bathrooms and air conditioning (hot/cold). UK TV and fibre broadband Wi-Fi installed. Alameda del Mar is relatively new community on the Spanish Orihuela Costa sympathetically developed to create pleasing properties. El Rincon is similar to the other Gomedio builders’ communities in the locality such as La Calma, Las Terrazas, La Quinita and El Bosque. We are just off the N332 by Lidl roundabout. Very convienient for Murcia (Corvera) and Alicante airports. A great holiday destination. Torrivieja is the nearest main town. Rental El Rincon will not be dis-appointing. 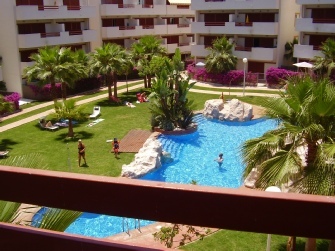 The apartment at El Rincon Playa Flamenca is located in a friendly secure development at an area called Alameda del Mar, on the doorstep of Playa Flamenca closes to beaches on the Orihuela Costa, Southern Costa Blanca, Spain. Ideal for your Costa Blanca holiday rentals and only a short walk to facilities such as the Playa Flamenca Commercial Centre or Citrus Centre behind El Rincon.